The Frenchman is away for the next two weeks, which means I’m puttering around the house after work, staying up way later than I should, both thrilled by the quiet, atypical aloneness, and simultaneously dreading it. I tell myself that I’ll use the luxurious, stretching evening-time to get extra work done, but this plan usually devolves into Netflix-watching pretty quickly. We spent this past weekend in Phoenicia, NY for the wedding of good friends. Have you been? It’s lovely, quite literally nestled in the Catskill Mountains, with a few-blocks-long main street and a creek running through it. I woke up early both mornings, thanks to the jet lag I try to keep going as long as possible, and it was the need for sweaters–more than the multitudinous appearance of apples and grapes at the market–that finally made me realize that fall is on its way. For now though, this in-between time means that I can still eat reckless quantities of peaches and tomatoes, but also that the subway platform doesn’t feel like a sauna sponsored by Hades. It means that, while I’m still hanging on to summer produce, I’m transitioning from raw preparations to heat coaxed ones: folding slumping fruit into cakes, baking zucchini with rice and cheese, simmering fresh beans until soft and soupy. 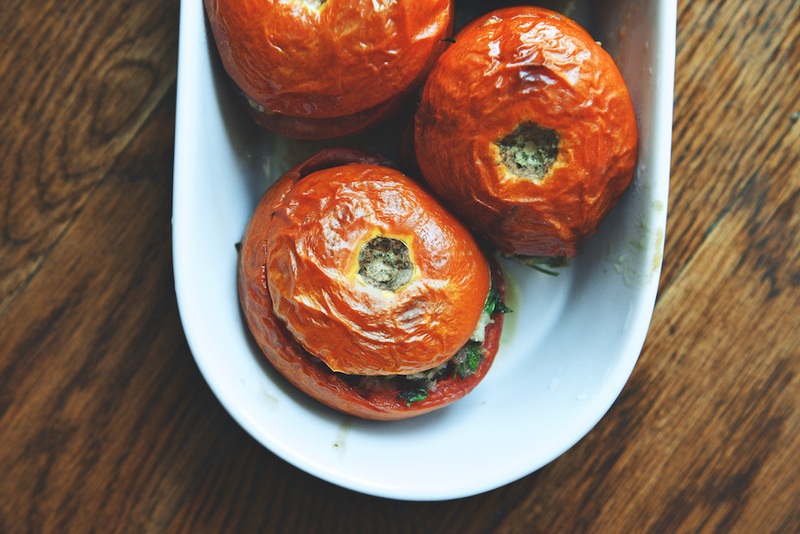 And making these tomatoes. 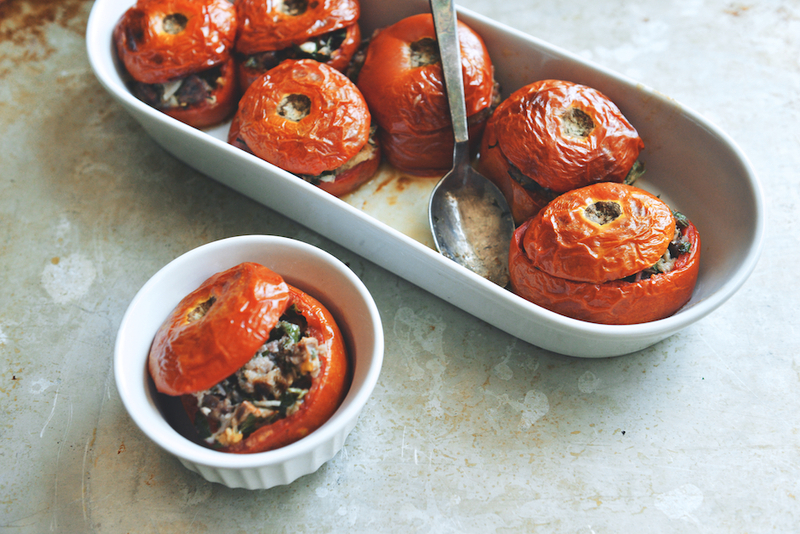 In France, you can ask the butcher for a pre-made stuffed tomato blend and on our recent visit, my mother-in-law made a batch so delicious, I ate three. I was first inspired by Mimi’s recipe, and then by Deb’s, which works well for vegetarians. I’ve used both red wine-rosemary sausage and duck sausage with good results. Heat the oven to 400F/205C. Slice off the top 1/2-inch (1 1/3 cm) of each tomato; set the tops aside. Scoop out the insides of each tomato–I use a melon baller. 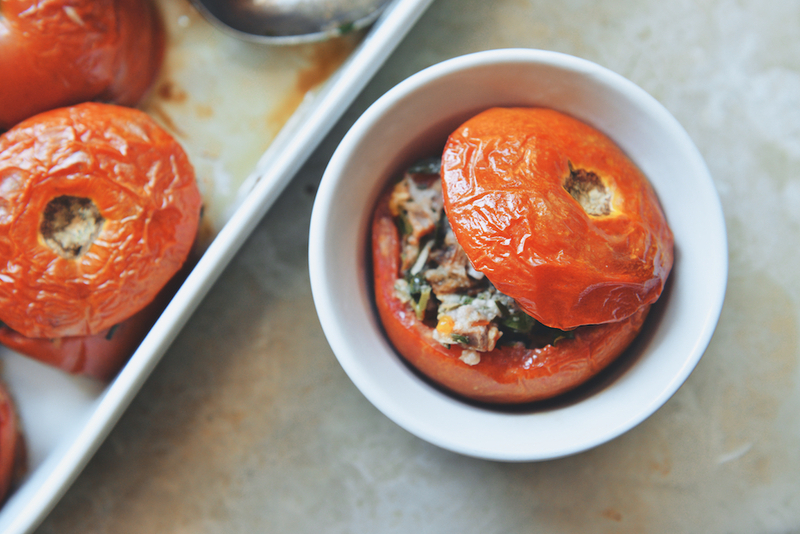 Move the hollowed out tomatoes to a baking dish. Generously season the inside of each tomato with salt and pepper. Soak the bread in the milk for 10 minutes; drain. Squeeze the sausage meat out of the casings and into a mixing bowl. 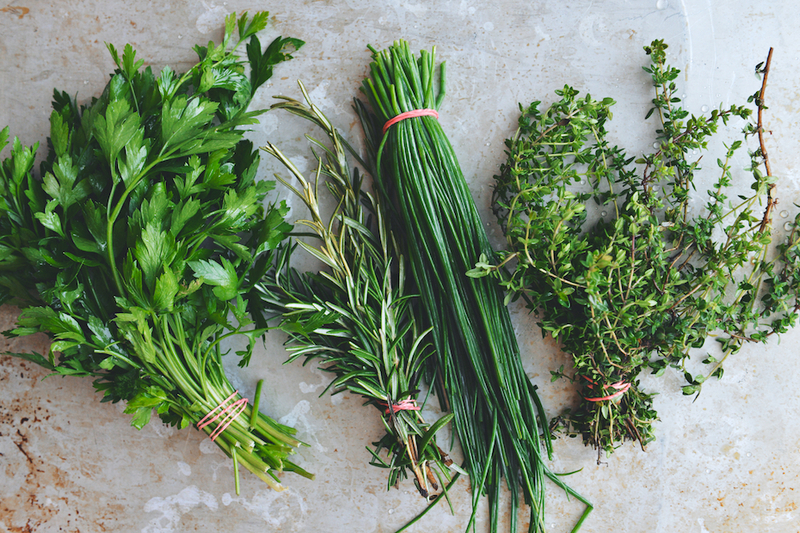 Add the: drained bread, bread crumbs, Dijon, shallot, garlic, parsley, basil, thyme, chives, rosemary, red wine, Parmesan, red pepper, and 1-2 teaspoons salt; mix gently until combined. Divide the mix between the 8 tomatoes. Drizzle a bit of olive oil (about 2 tablespoons total) over the tops of the tomatoes, and then put the “tops” back on. 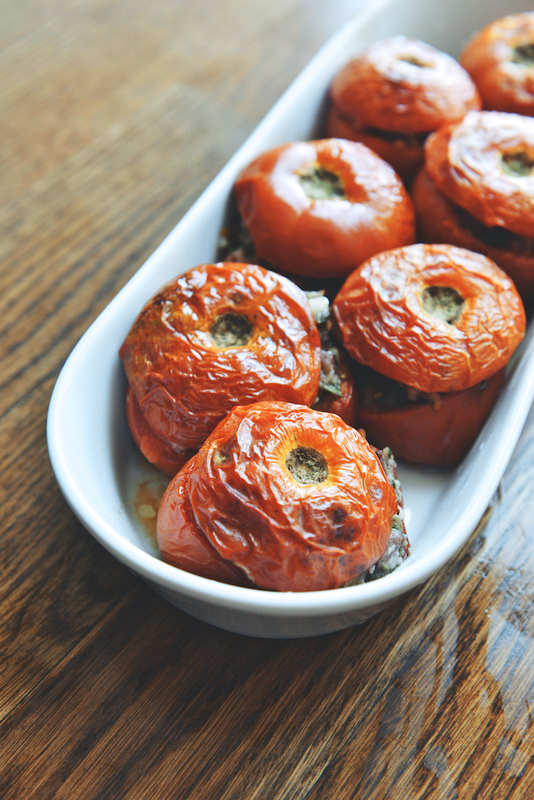 Drizzle the remaining 2 tablespoons olive oil over the tomatoes, and into the bottom of the baking dish. 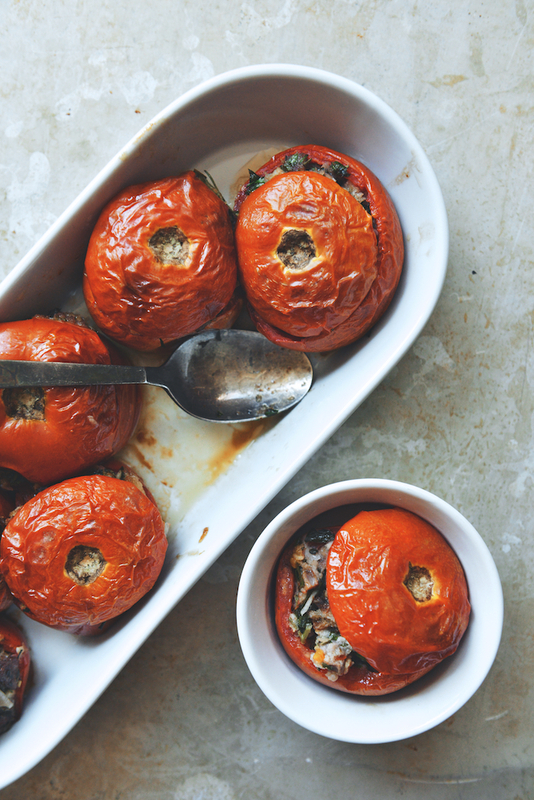 Bake the tomatoes for 35 minutes, until the bread-crumb mixture is golden and the tomatoes are soft and gently bubbling. Let cool slightly before serving. Catching up on your lovely prose and recipes this morning — I love this so much! The good and bad of the “quiet, atypical aloneness,” how the evening stretches when you’re on your own (and all the grand plans devolving into Netflix) — all soooo real. (And the subway platform, THE WORST.) 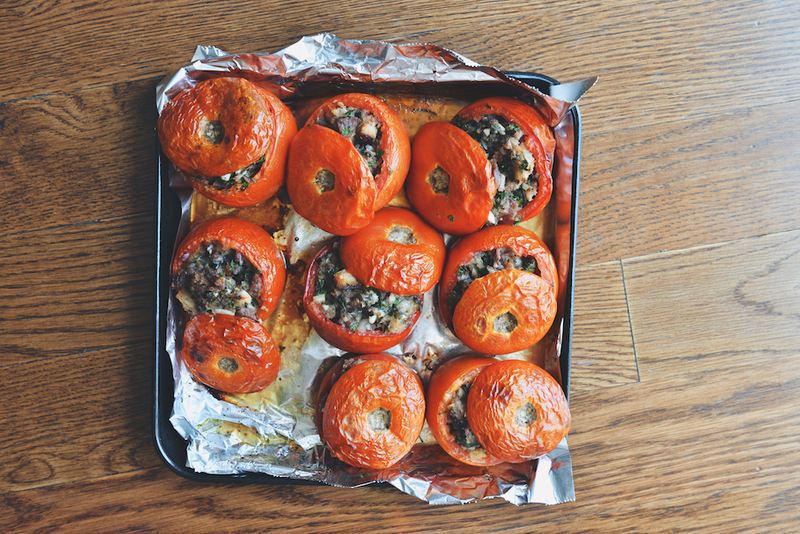 On top of all that, these tomatoes look divine. Late summer perfection. This looks delicious I love your blog!